Comment Is it top or low gear 2 ? First of all i want to say that this game is basically a crappy title ,tou its one of the better racers on the cd32 as there really aint too many on the cd32. The point of the game: is basically to drive trough all the tracks in a championship mode either as 1 player or 2 player, when you finnish a track you will get money and them you can spend on engines,gearboxes,tires,turbo's and more in the shop before every race starts, in the race you have a couple of turbos as preset always and thats a nice treat really. Every race you should rank 3 or better whilst in 2 player mode one of you is only needed. 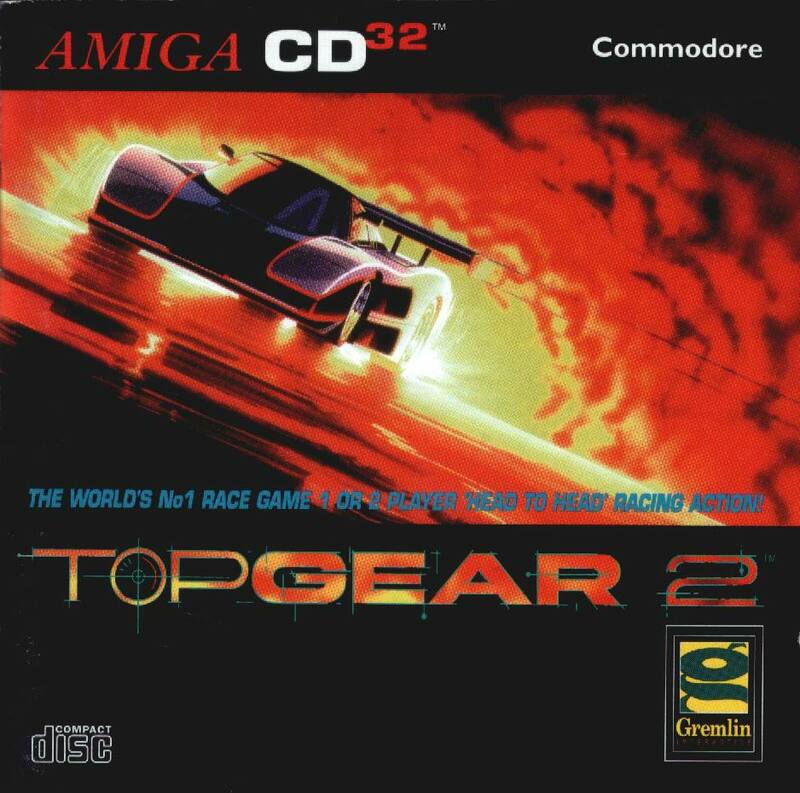 i want to say that this game is basically a crappy title ,tou its one of the better racers on the cd32 as there really aint too many on the cd32. The point of the game: is basically to drive trough all the tracks in a championship mode either as 1 player or 2 player, when you finnish a track you will get money and them you can spend on engines,gearboxes,tires,turbo's and more in the shop before every race starts, in the race you have a couple of turbos as preset always and thats a nice treat really. Every race you should rank 3 or better whilst in 2 player mode one of you is only needed. Music,gfx and FX: basically this is the same as the a1200 version but it has better music as its cdda and its nice even! !, but there is a downside as the FX is somewhat to LOW so you wont hear too much from the engine's nor the sliding in the bends. The gfx is a mix of ECS and AGA (same as the A1200 version) wich is abit lame as you should think that after releasing so many titles(Gremlin) they more or less would have atleast updated all to the better. The Gfx in this game is SLOW and Jerky and i have infact problems keeping awake when i play it, but it does help to play it in ntsc MODE. 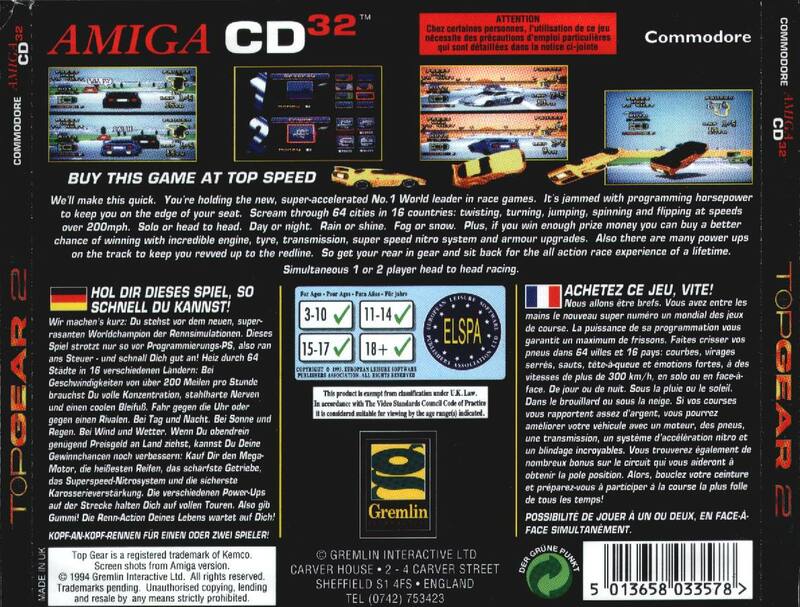 Additional Info: well you have just a couple of racers on the cd32 like this one,and they are Lamborghini Challenge (the Best),Lotus Trilogy and Nigel Mansell. And thats why you will eventually end up with this one, tou many love lotus, well so did i but when i got the cd32 version i got upset over NO extras (well 1 CDDA) This game have atleast some sort of upgrades and its a potential classic let down by jerky gfx and whats annoying me is why they didnt use the LOTUS engine for this game as that would have certanly helped ALOT!.